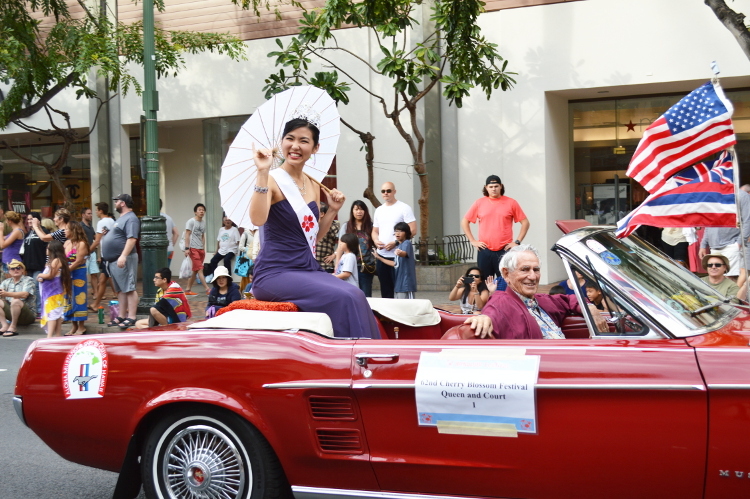 The Grand Parade was held on Sunday, March 8, 2015, on Kalakaua Avenue. 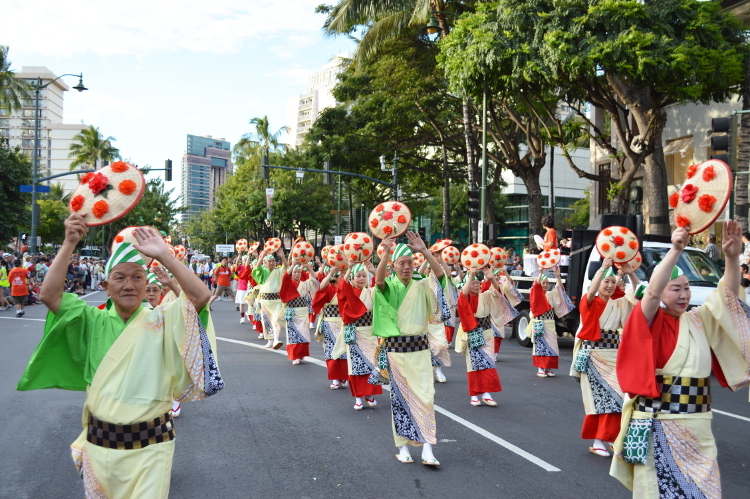 It was the last live performance by the participating groups. 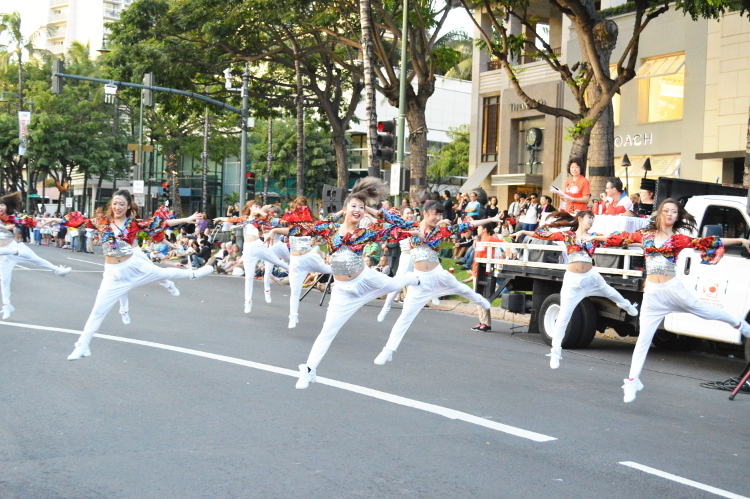 The visitors from around the world gathered on Kalakaua Avenue to watch the performance. 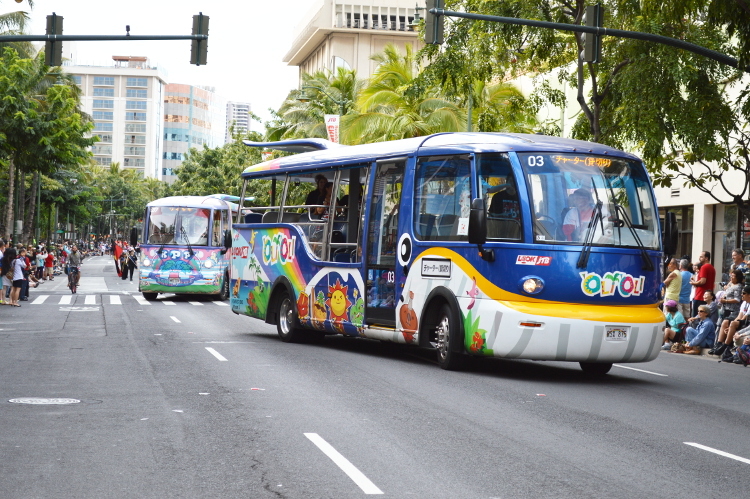 It started from Saratoga Road and ended around the Honolulu Zoo area which was about 1.3 km long. 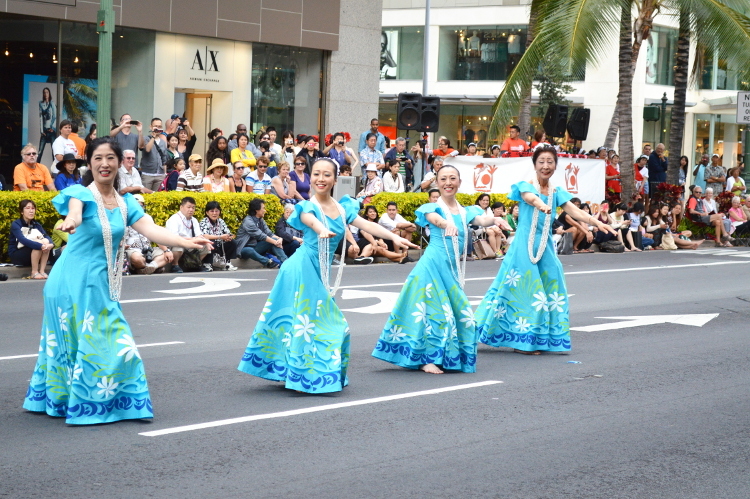 The opening performance was held in front of the 4 locations of Kalakaua Avenue. 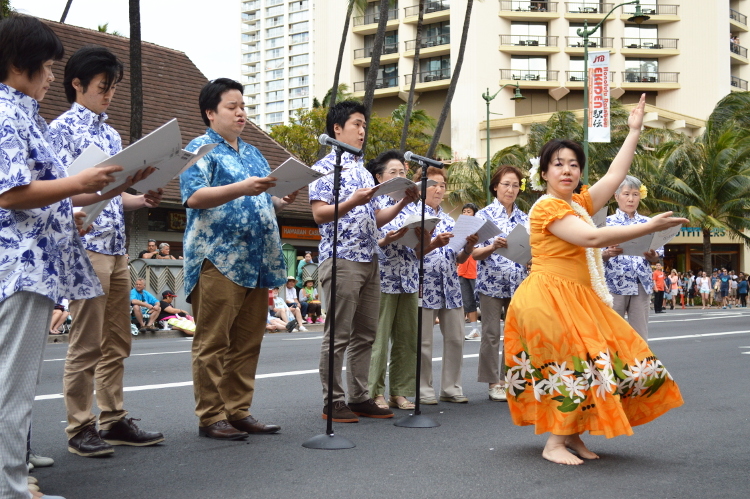 The performers from Honolulu and its sister city Kashiwazaki performed a chorus and hula dance at the main stand in front of the Moana Surfrider Hotel and Westin Hotels & Resorts. 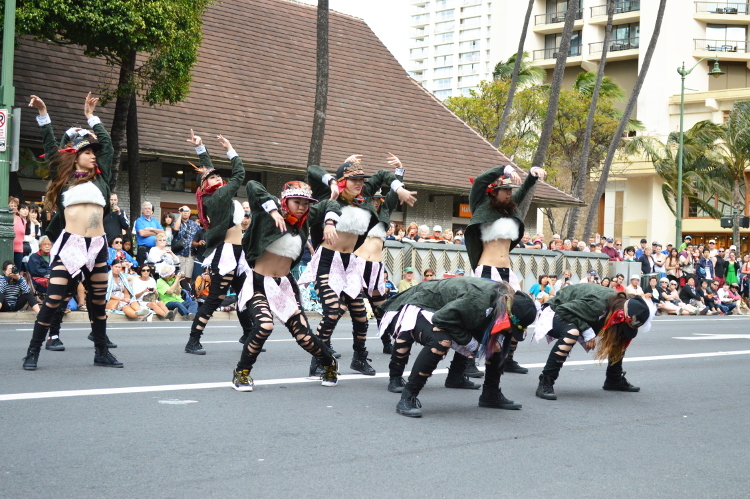 Their impressive performance fascinated the audience. 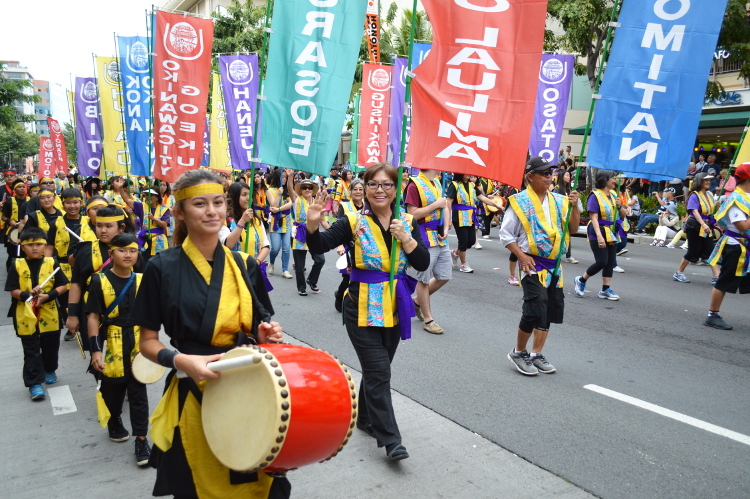 Furthermore, there were various performances such as singing of the national anthem, dances and shamisen by the other MC stands. 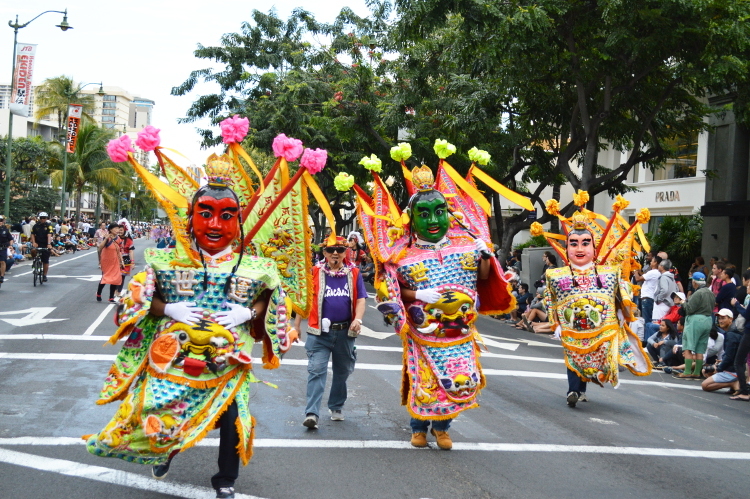 They performed simultaneously which entertained the audience. The time was 4:30 PM. 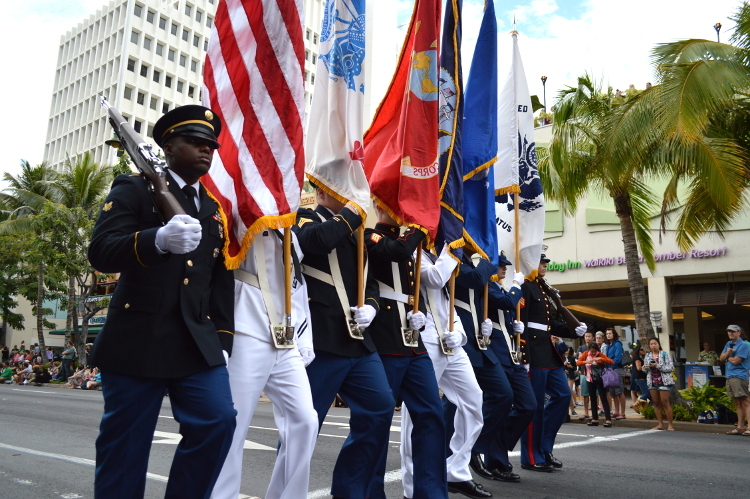 The Grand Parade began with a marching performance by the military band. 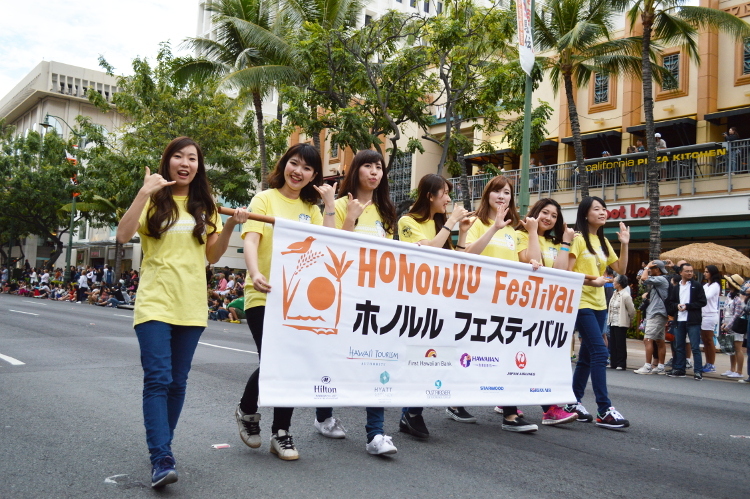 The volunteers held the Honolulu Festival banner while they paraded on the streets. 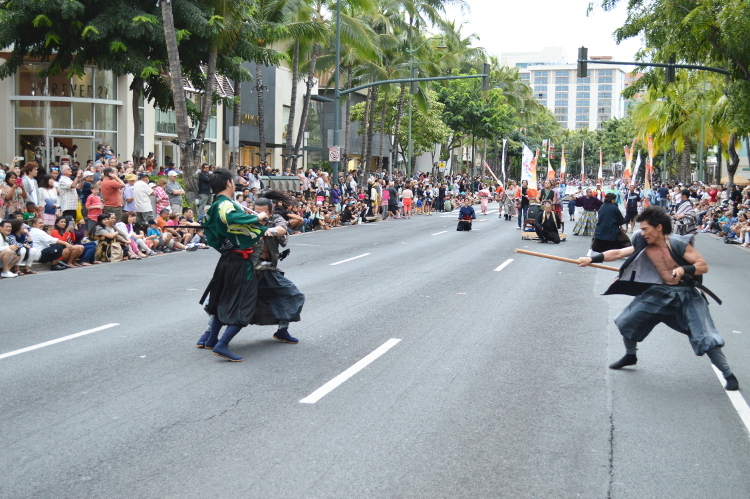 Also, the audience cheered while the marching band, dance and sword fight were performed, which the camera shutter sounds echoed loudly throughout the streets. The ‘OLI ‘OLI Walker performed a continuous curve driving which brought much excitement. 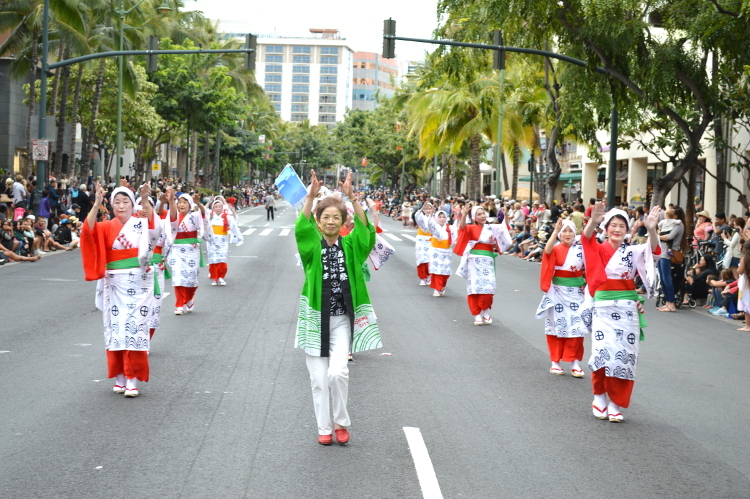 Note that this trolley performance was exclusive for the parade. 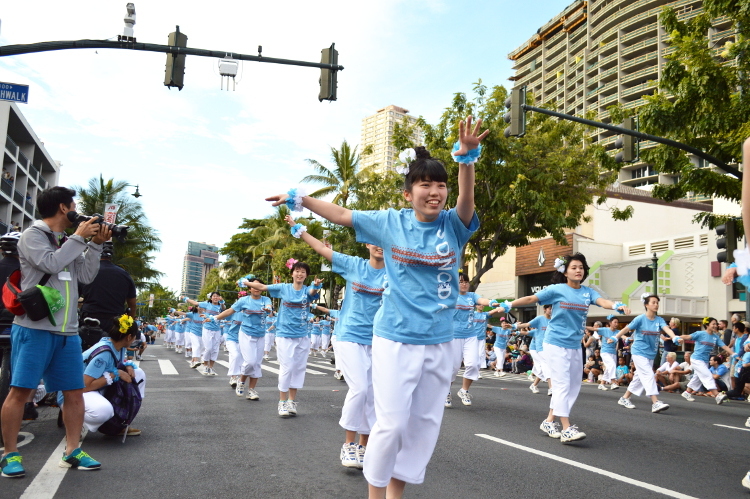 The participating group from Sonoda Gakuen High School that had the largest number of 231 students danced to the Japanese music hits. 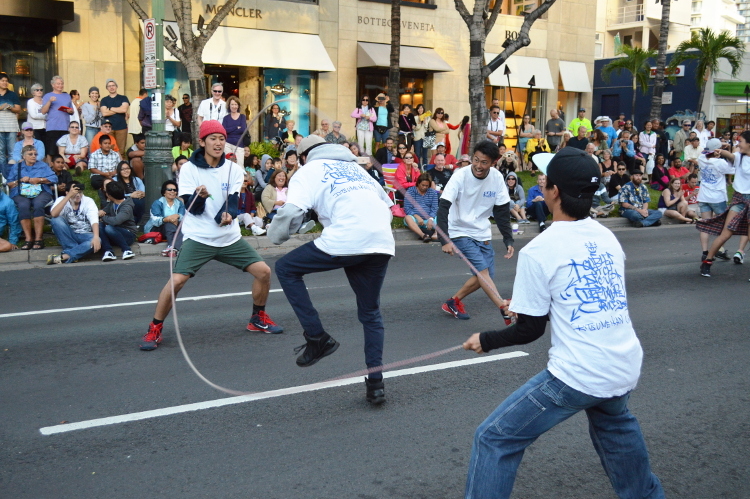 Their youthful moves hyped the crowds. 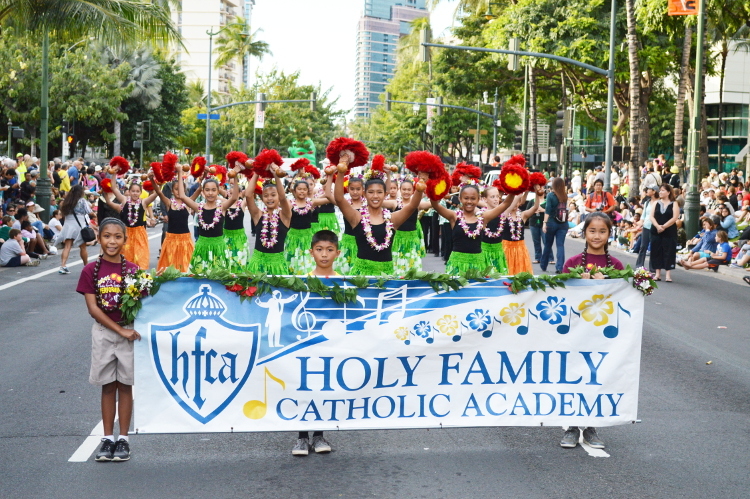 Each performer had performed vigorously and gracefully with a wonderful smile, which brought a lot of excitement while the audience warmly watched over the performances. 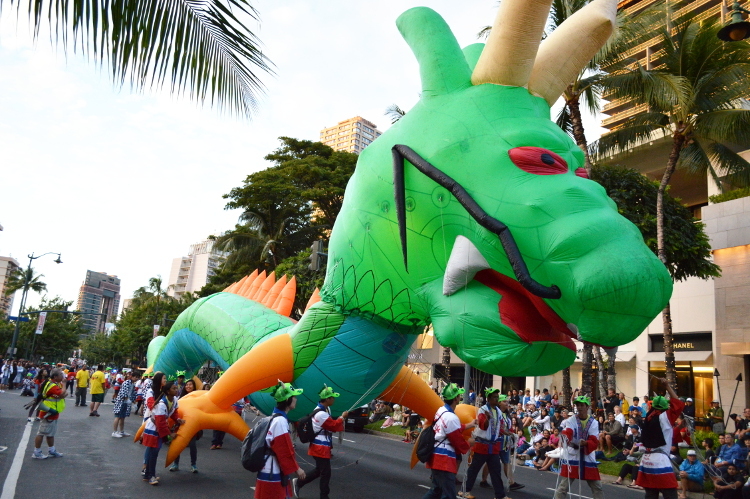 The big dragon from Saitama Ryujin Matsuri Kai had appeared. 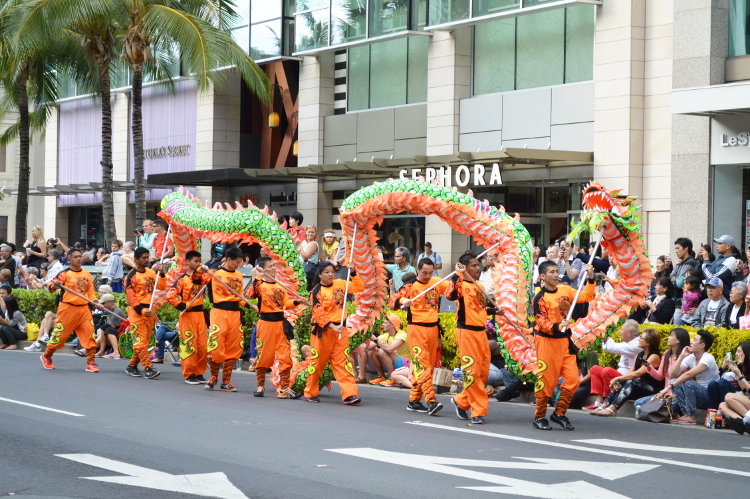 Ryujin was floating gently in the air of Waikiki, which brought excitement with its glaring red eyes. 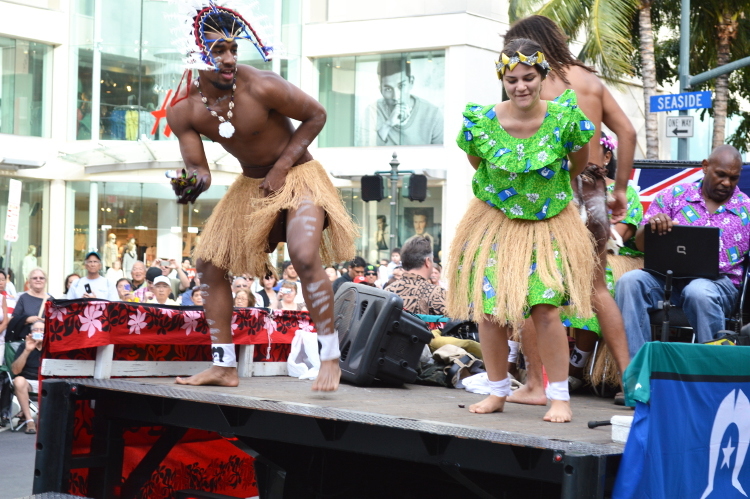 Sometimes, it dived into the audience along the roadside which amazed them. 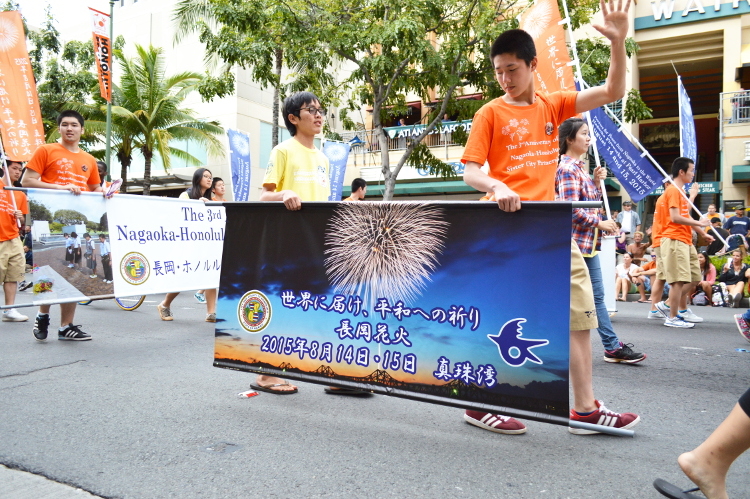 The Grand Parade reached a last phase and the sky started to darken. 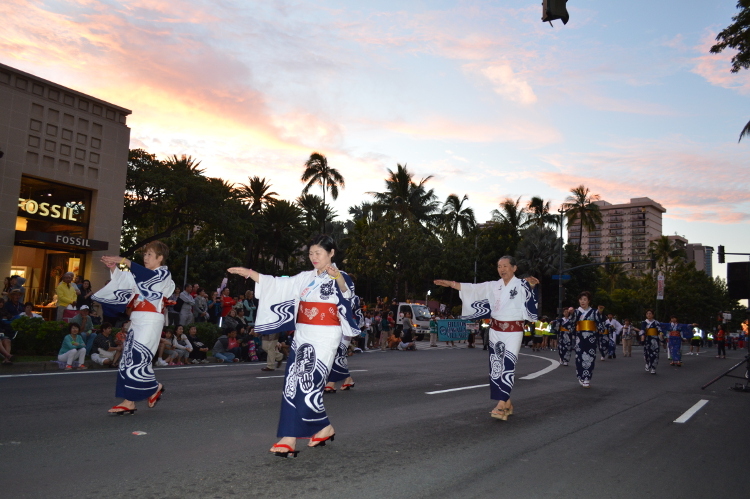 Also, the Japanese traditional dance called the Gujo-Odori and Awa-Odori were performed. 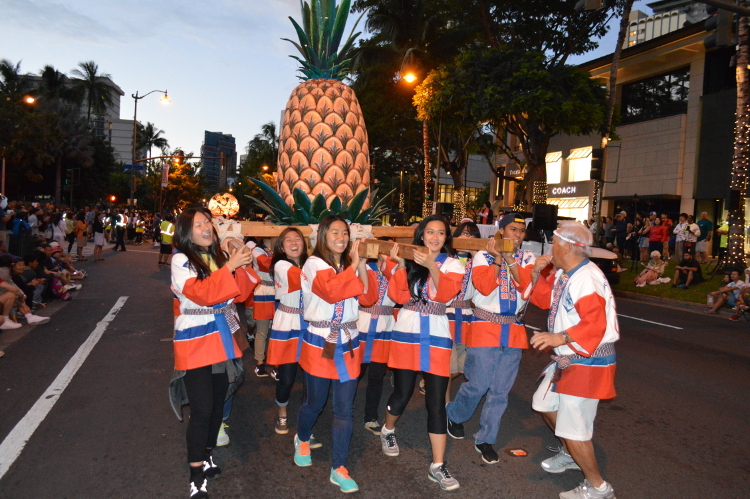 In addition, a portable shrine had appeared with a unique Hawaiian design of a pineapple. 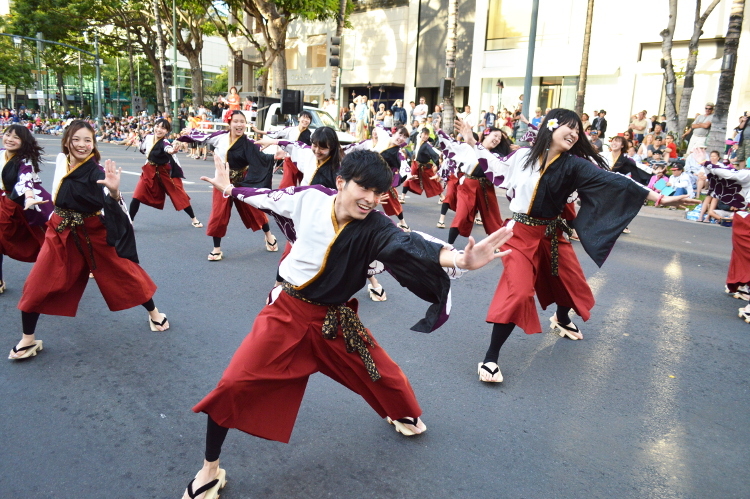 The performers encouraged each other and performed vigorously. 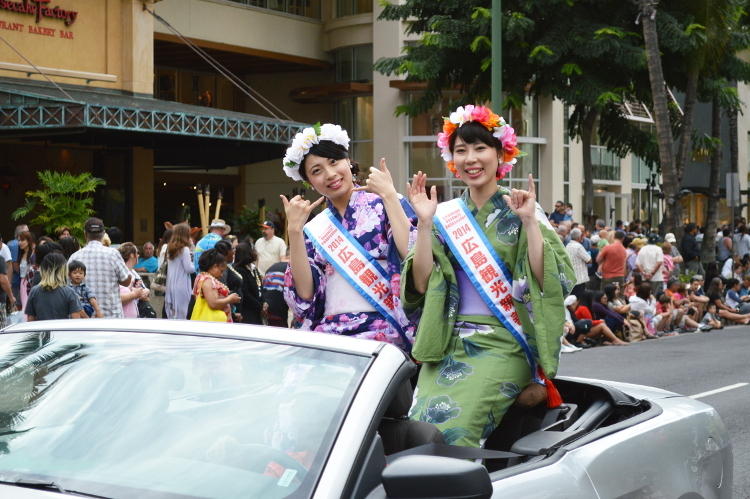 Once again, Hirosaki Nebuta had arrived! 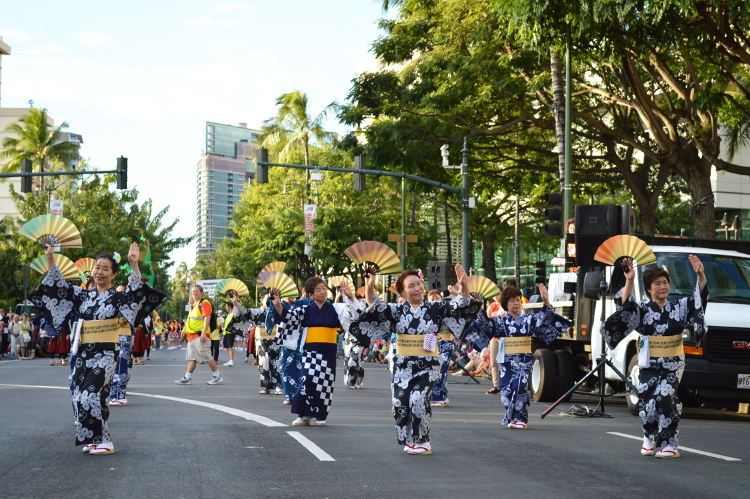 It feels much different to watch one of the famous Japanese festivals in Hawaii. 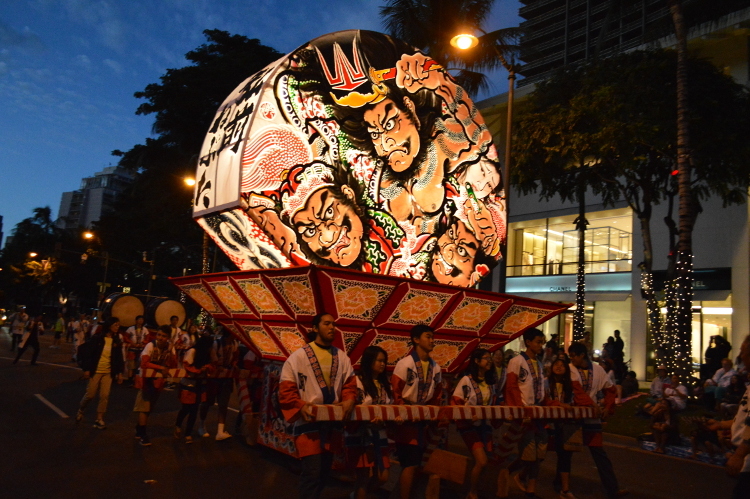 The gigantic lantern floats gently while it softly illuminating the lights in the nightfall. 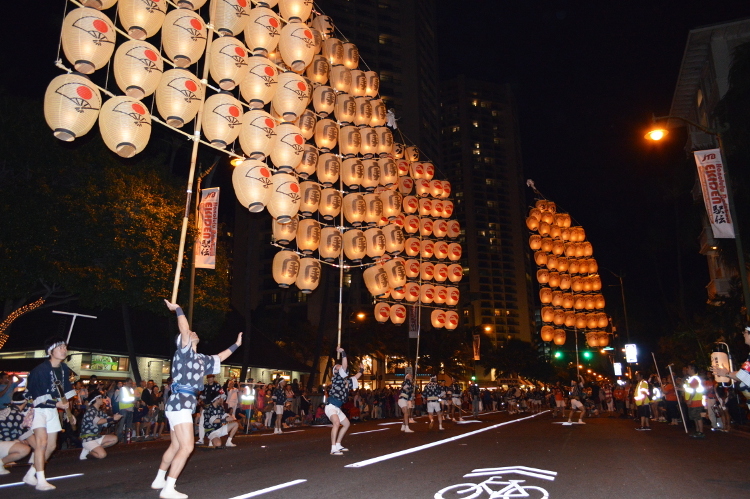 The surprised performance by the Akita Kanto Festival first appeared with the Japanese lanterns illuminated by fire on the bamboo poles. 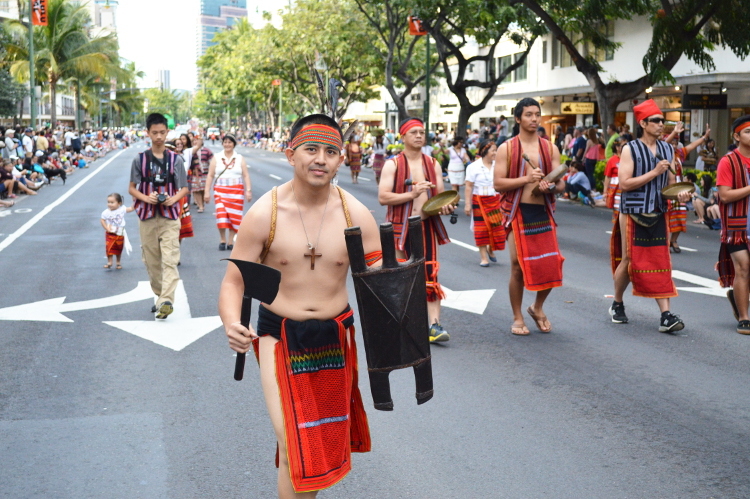 Each celebrant will be holding the bamboo pole that weighs more than 110 pounds just by using an arm or over the forehead. They gave a great enjoyment to the audience. 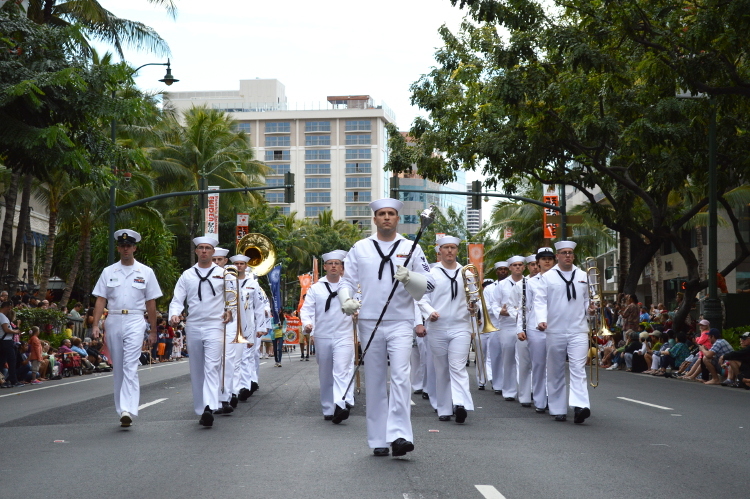 The parade lasted about 3 hours long. 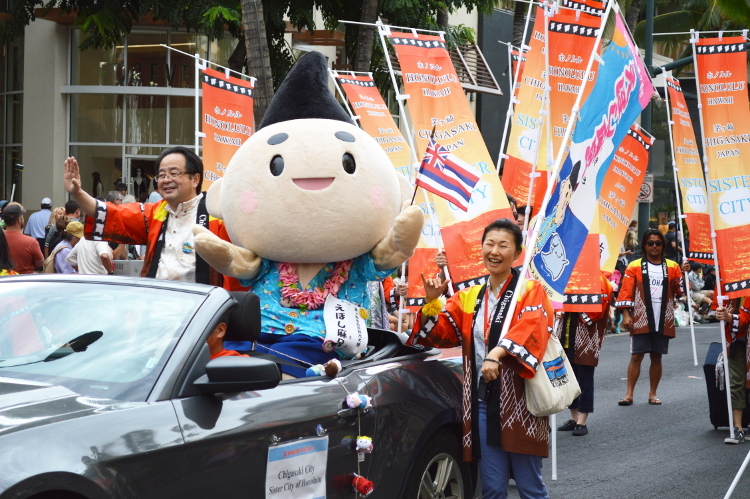 The Daijyayama appeared on the scene for the finale which was led by a total of 200 people. 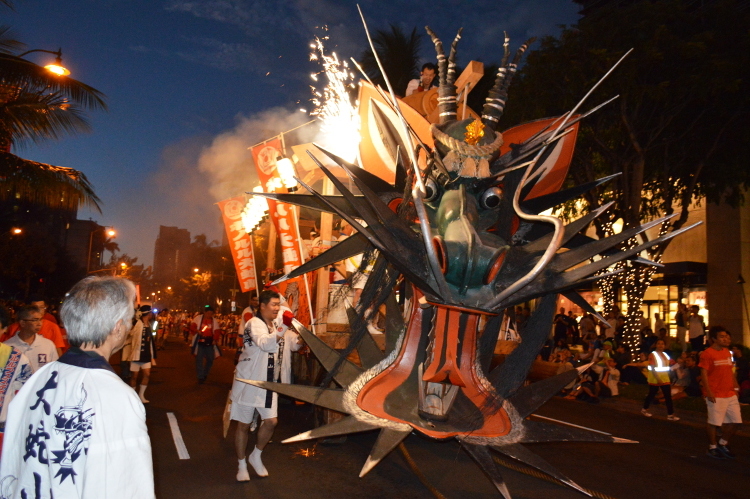 The sparks scattered along the street as the Daijyayama made a powerful entrance. 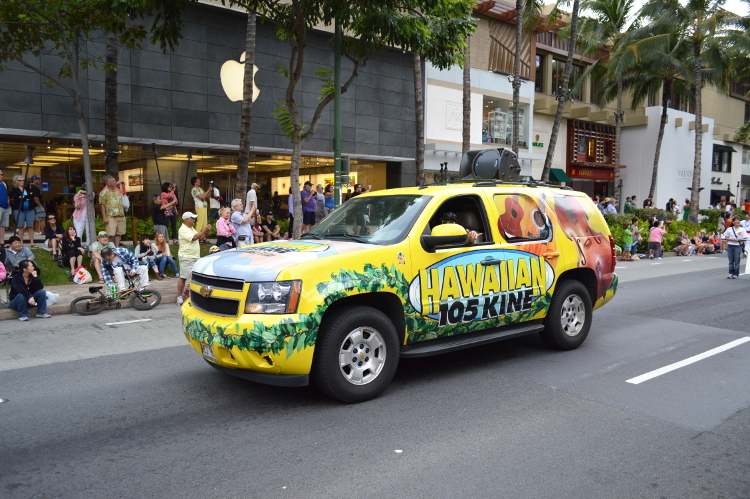 Furthermore, the Consulate General of Japan, Shigeeda and the governor of Hawaii, David Ige rode on the Daijyayama from the front of the Moana Surfrider Hotel. 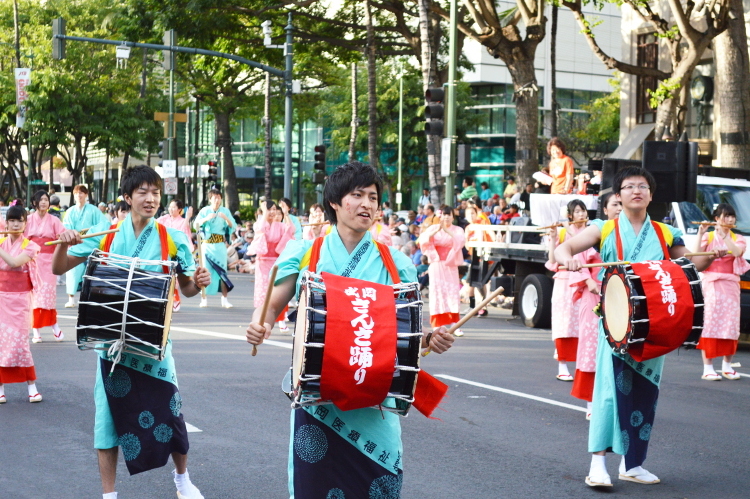 The performance reached its climax with many cheers and a big round of applause. 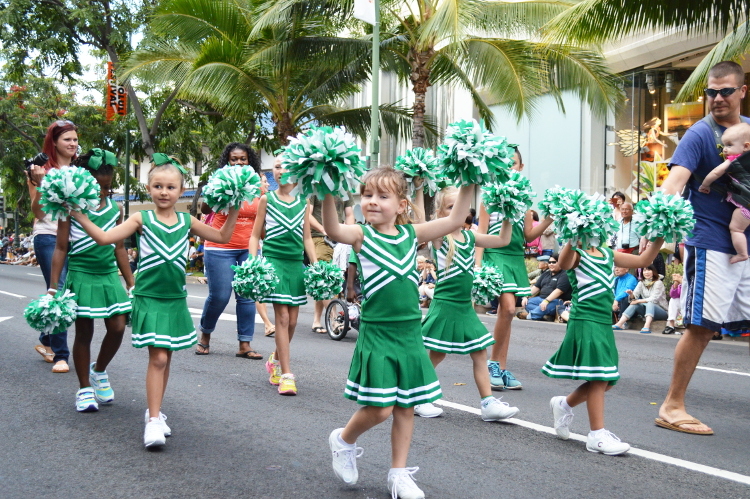 Everybody seemed highly anticipated for the parade next year as well. 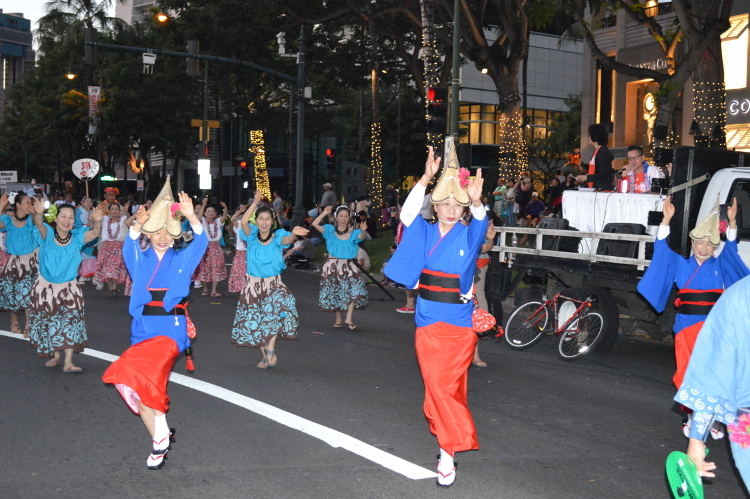 The performers felt a sense of accomplishment while the audience seemed gratified by the performances which were inspiring. Please look forward to our event next year!